I have been trying to get my child involved in doing things around the home but what usually happens is that he ends up playing with the things and I end up doing the task. How can I get him more engaged in completing the task? It sounds like you need to adjust your expectations a little. Children of this age are not results orientated and they will certainly not do things at the same speed as you might like them to get done. At first you will need to work side by side with your child in an 'I do one, you do one' collaborative effort. 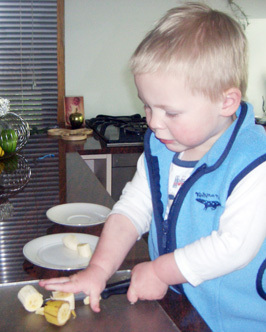 To expect your child to do the whole task independently is unrealistic. When your child gets distracted refocus his attention by focussing on a small detail. For example, if he is helping you to put all the dirty clothes in the washing machine challenge him to find all the socks or all of his shirts while you continue to put the rest of the clothes into the washing machine. Focussing him on one part of the task will help him to stay engaged and give him a feeling of success when he has completed it. I would like to do these practical things with my child but I am afraid that he will hurt himself. If he is going to cut up a banana, for example, he needs a knife that really cuts or he won't be able to do it but if I give him a real knife he might hurt himself. What do you suggest? You are quite right he does need a knife that will really cut and if we are going to give things like this to small children we need to think carefully about how we do it. It is important to show your child how to hold the knife in a way that won't hurt him, with the blade down and his fingers on the handle. It is not necessary to give him a knife with a sharp point but you can show him that the blade is sharp and he needs to be careful with it. Show him where he needs to put his fingers of the other hand on the banana so that he does not cut them. You will be surprised how careful he is with a knife when you have helped him to see that it needs to be handled carefully.